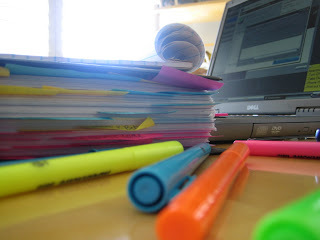 See that stack of papers neatly color-tabbed and full of highlight markings to the left? That is what we law students do for fun. Okay, maybe fun is not the most appropriate word. But it was optional. Who is crazy enough to do this all optionally? Law students. See, despite the fact that the test to get into law school is all about logic, we are not logical. Exhibit A: This write-on competition. We pour through hundreds of pages reading and write a 10 page paper, knowing that the changes that we'll "write-on" is fairly slim. I at least take solace in the fact that even if I don't make it on to journal through this competition, 1) there's still a possibility that I can "grade-on" and 2) these cases that I'm reading now are extremely funny. Though I am not allowed to talk about this competition, I will just say that the Supreme Court and a "bong" are involved. This subject comes along, of course, after spending the weeks before this working on a prosecuting a fictional cocaine-dealer. I wonder if the law school people are trying to tell us something.